Setting goals, engaging in consistent marketing, networking and coming up with fresh and relevant content are some of the daily chores that people face when they are trying to find success with affiliate marketing. 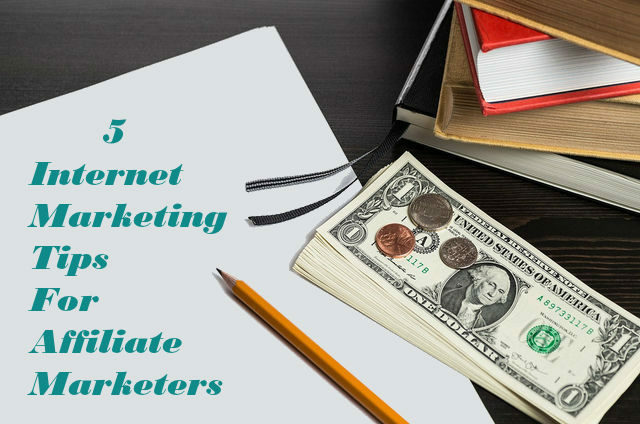 With that said, here are 5 Internet marketing tips that you can take to the bank. The first tip is to set goals. Many Internet marketing newcomers experience an industry shock when they realize the endless amount of freedom they are given. While it is certainly a benefit to be able to do whatever you want, it can also lead to procrastination and a poor work ethic. Setting goals will keep you focused and motivated to strive for bigger and better things. Do something in your business every day, which will bring you closer to meeting your long term goals. Create new content for your existing websites, write articles related to your affiliate marketing niche and submit them to article directories. There is a never ending list of tasks that you can work on every single day. Perhaps the number one thing you want to focus on other than the customer is your marketing. Consistent marketing is the key to generating traffic and creating sales. For this reason, it is vital that you devote as much time as possible, every single day, to promoting your business. You will be happy at the end of the day, once the traffic starts pouring in. Next on the list of internet marketing tips is to network. This follows along the path of marketing, as you can network while you promote your business. Participate in forums that are relative to your business, leave comments on other blogs that are similar to your niche. The more people you know, the better chance you have of your business becoming known. Get out there and meet new people, as relationships are the key to success. The Internet is polluted with the same monotonous content all over the place. You can go from site to site and read the same exact re-hashed content without learning a single thing that you haven’t seen before. It’s important to research your topic and find out as much information as you can before posting about it, and bringing your own expertise or ideas about the subject to the table is equally as important. Mix things up and get creative with the content you distribute on your website and elsewhere online. People are looking for trending ideas and pieces of information. Creating fresh, informative content will give you the upper hand on your competitors. It is natural to be proud that you have started your own internet marketing business and strut your stuff a little. And though it is quite an accomplishment to do everything on your own and work at it until you finally make it profitable, you are still better off putting aside your arrogance and asking for help from the experts. Everyone who owns any kind of online business has needed assistance with something at some point, whether it is with writing enticing content, designing a website, or advertising, and there is no shame in asking for help when you need it. You can get tons of Internet marketing tips if you’ll just ask people who have been around for awhile and are making money in their businesses. Regardless of what area you lack knowledge and skills in, you can find people who are willing to give you some valuable advice if you’ll just look for them and then actually allow them to help you. Next articleHow to start a home based business? 2 important things to ensure success!